Are you a designer? 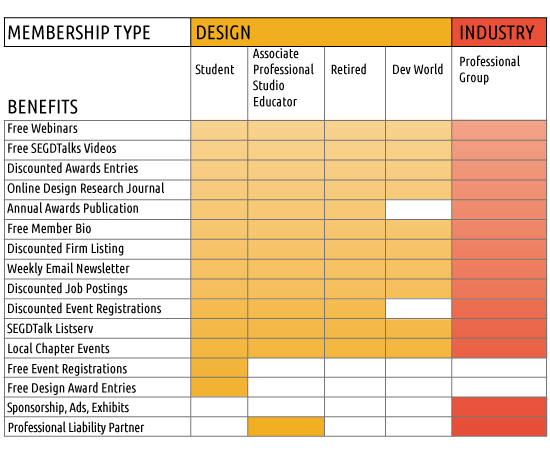 Design memberships are for people whose primary occupation or course of study is experiential graphic design or related fields such as architecture, brand design, interior design, landscape architecture and other forms of visual design as an individual, at a firm, or in-house for a company. Are you an industry member? Industry memberships are for people who are involved in businesses which manufacture, fabrication and/or supply of technologies, products or services related to graphics, sign or exhibition industries. Did you know: Member Bios on segd.org receive 500-2000 reads a year and over 20,000 impressions. Plus, your bio can link to your firm, projects, awards and more.That's a lot of exposure for you and your business! Member Bios are free with membership. Get started today! Want to get involved on a local level? 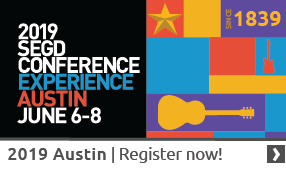 Join your local SEGD chapter! 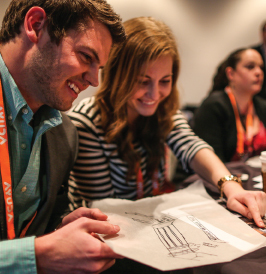 SEGD has chapters all over the United States, and worldwide that hold fun and educational events tailored to the design community in your area. Find yours today! Promote your business as a member with a discounted Firm Listing on segd.org, to the community of over 282,000 visitors every year. Expect over 200,000 impressions and about 1,500 reads a year for individual listings. Don't miss out on this targeted promotional opportunity. Join the global community of professionals who create experiences that connect people to place. We're a multi-disciplinary network of designers, industry and technology specialists, educators, and students dedicated to experiential graphic design. We work in wayfinding, placemaking and identity, digital experience design, exhibitions, public installations, branded environments, and other aspects of EGD/XGD. We're most proud of the incredible digital value we have developed for members over the past 5 years. So even if you are never able to attend a single event, we've got you covered. SEGD offers incredible value anywhere, anytime. Read more about being a contributing SEGD member can support your firms marketing and new business awareness building efforts. You'll be surprised how effective we are! Call us: +1-202-638-5555. We're here to help weekdays 9-5 ET, or by email.